It’s every holiday traveler’s worst nightmare: A semi-truck, seemingly out-of-control, barreling toward you on the expressway at a high rate of speed. Gary personal injury attorneys know know tractor-trailer accidents are not an everyday occurrence. But too often these crashes are deadly and a recent spate throughout the Midwest reminds us of the risks as we enter the busy holiday travel season. We expect these kinds of crashes will increase over the holidays, with a combination of icy winter weather and the tendency of trucking companies to overload their vehicles and overwork their drivers in an attempt to meet end-of-the-year demands for goods and materials. One recent case unfolded in Ohio late last month, just ahead of Thanksgiving travel. According to news reports, the early morning crash resulted when the driver of a 2011 Freightliner tractor-trailer heading southbound in Mercer County blew threw a stop sign on State Route 29. Police say he struck a vehicle driven by a 56-year-old Portland, Indiana man, who subsequently died of his injuries. After hitting that vehicle, the semi slammed into a pickup that was stopped at the same intersection. That driver also suffered injuries. The extent of those injuries was not immediately released by authorities, though they were not believed to be life-threatening. Following that incident, a semi-truck crash in Evansville resulted in hours-long road closures on I-164. Officials reported that a truck carrying a large load of coal ran off the roadway, off the right shoulder, through a barricade and down an embankment. The driver was seriously injured, though thankfully, no other vehicles were involved. While the cause of the crash remains under investigation, officials believe a tire blow-out might have been to blame. Just a day after that crash, in Michigan, a semi-truck crash ended in the death of a 30-year-old teacher whose vehicle was trapped under the I-196 southbound truck shortly after 6 a.m. The truck driver reportedly pulled out of a restaurant parking lot, evidently failing to yield to oncoming traffic. Incidently, it was the same spot where two years earlier, a similar error made by an Indiana trucker resulted in the death of a 38-year-old father and two of his children, ages 13 and 4. Two other children in the vehicle suffered serious injuries. The trucker in that case pleaded no contest to charges of negligent homicide, and was ordered to serve two years of probation. Following that incident, residents had requested either a reduction of speed on that stretch of roadway or a traffic light. However, city officials decided not to do either. There are now renewed calls for action in the wake of the latest crash. Avoid cutting in front of large trucks – or any vehicles, really – as you might inadvertently create an emergency braking situation for the vehicles around you. Bear in mind that large trucks, buses and other big vehicles take longer to stop than smaller vehicles. Keep in mind that larger vehicles have bigger blind spots around the front, back and sides. If you can’t see the driver of the truck in the truck’s mirror, than the driver probably can’t see you. Be mindful of the fact that large trucks tend to make wide turns. If you try to squeeze in between the truck and the curb, you might find yourself caught in a so-called “squeeze,” which might result in a serious wreck. 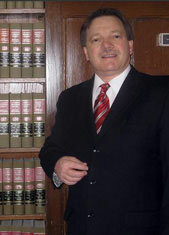 Indiana Injury Attorney Burton A. Padove handles injury cases throughout northern Indiana, including Gary, Hammond and Calumet City. Call Toll Free 877-446-5294.